These accessories are used for mounting masts to the vertical surface of a vehicle or building. 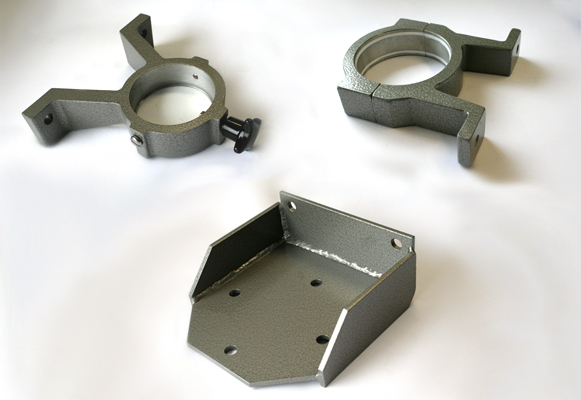 The accessory kit comprises two brackets. The aluminium top bracket is one-half detachable to allow for removal of your mast without disturbing the bracket fixings. These accessories incorporate Teflon bearing rings to protect your mast. The lower-bracket has a Teflon disc to permit easy rotation of your mast as well as a thumb screw for locking your mast in any desired azimuth direction. With the NX and NY Series of masts, the bracket is made of galvanized steel onto which is bolted an aluminum base plate with a collar brake. (Hole centers NH, NK and NL masts 5.9″ for M10 bolts. NX masts 5.9″ for M12 bolts and NY masts 7.8″ for M12 bolts). These accessories are used for mounting masts through the roof of vehicle. The assembly is comprised of an upper and a lower aluminum bearing. The upper has three separate components. A flange, fitted with a Teflon ring that is bolted to the outer skin of the vehicle, a tapping plate and a weatherproof shield that clamps to the mast. The lower bearing base plate has a Teflon disc to permit easy rotation of your mast and a thumb screw for locking it into position. The NX and NY Series masts have a optional locking collars. The base plate is bolted to the floor with 4-M12 bolts spaced on 5.5″ P.C.Dia. There are two variants for the NY Series masts, either for rotating or non-rotating masts. These accessories are useful for field applications and provide easy access to locking collars and antennas. The climbing steps clamp in any position on the mast’s lower section and fold upright for transit. Single steps for climbing. Double steps for resting. 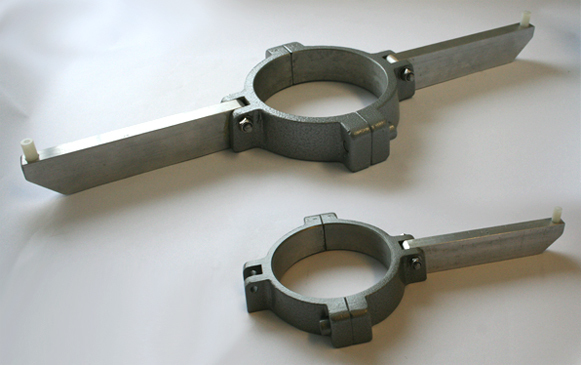 These accessory handles assist in the easy rotation of your mast and fold to a vertical position when not in use. These accessories may be fitted after installation.